Many have inquired about starting a SongFarmers chapter so we provide this page to answer the questions you might have. Join us! WHO CAN START A SONGFARMERS CHAPTER? WHAT DO WE CALL OUR MUSICAL GET-TOGETHERS? 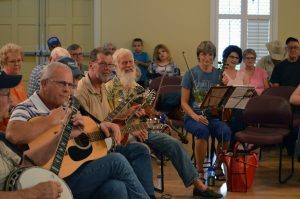 WHO CAN COME TO MY LOCAL SONGFARMERS GATHERING? Anyone … they do not have to be members of the WFPA to be part of it, although we certainly hope they will eventually be part of our front porch family! SongFarmers are “building a front porch around the world” and each chapter is like a plank in that grand front porch. We are creating a community of leaders, those who love music for the sake of the joy and passion of it, who will bring their friends and neighbors together to play music and enjoy each others company. You plus one. That’s how it starts. Now keep in mind it will grow, sometimes quickly. But we believe small is good. Small is easy. Small is fun. Most local chapters have 8-12 attending. Others will have 200 or more. ARE THEIR TICKETS OR FEES? No. None. Nada. We help you for free, you start one for free. In turn your friends attend for free. Your front porch. Your living room. A local community center. Most public libraries will bend over backwards to have you organize a chapter in there meeting rooms. For free. 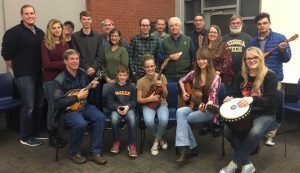 Our SongFarmers chapters in Cabot Arkansas, Lexington KY, Hinesburg VT and others all use their hometown libraries. Tellico Plains TN regularly has 50-80 folks attending in their hometown community center. Valdosta GA holds their in a radio station. Our chapter in Suwannee River Valley FL started in a state park and had to move into a much larger facility just to accommodate the crowds. Start small and grow as you decide. HOW IS A SONGFARMERS GATHERING RUN? Simple is best. Fun is better. Most chapters do it this way: your group sits in a circle facing each other, instruments in hand, and you all play the same song … together. This is not a concert but a group, musical sharing event. No stage. No mics. No PA system needed (unless you feel your size and growth warrants it.) Anywhere can be treated as if it was a “front porch.” This is what brings out the joy and comfort of community. Nobody is on the spot, no one takes all the risk. 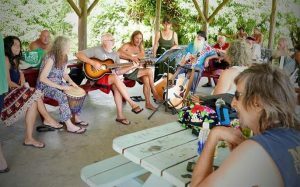 The experienced musicians mentor and teach the newcomers, all are EQUAL at a SongFarmers Gathering. I’M ALREADY PART OF AN EXISTING MUSIC JAM, CAN WE BECOME A SONGFARMERS CHAPTER? There are thousands … thousands … of wonderful, simple 3 and 4 chord public domain songs to choose from. We encourage public domain, traditional songs because no one “owns” them and they are free from royalty or licensing issues. We are publishing a “SongFarmers FrontPorch SongBook” with lyrics and chords soon, and that should help start you off! Anything, and we highly recommend keeping it acoustic. 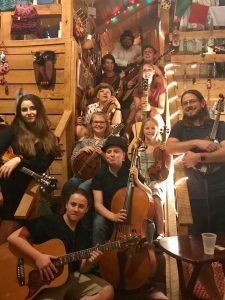 Guitars, banjos, cellos, fiddles, bongos, tambourines, mandolins, ukuleles, bass, dobros. A good rule of thumb is if it needs to be plugged in, it’s probably too loud for the group. IF SOMEONE DOESN’T PLAY AN INSTRUMENT, CAN THEY STILL ATTEND? Of course, and we want them to feel part of the front porch community. SongFarmers is all about “love.” Love for music, love for families, love for neighbors and building up our communities. Sometimes, the human voice can be the most beautiful instrument of all. Anyone who gives their time to sit and listen to others playing music is one of the greatest gifts the audience can give to an artist. We want, encourage, support and applaud any youngsters that want to be part of the SongFarmers Gatherings. On the WoodSongs broadcast, kids are featured on EVERY show. Kids today are hungry for real, organic experiences, especially when it comes to music and the arts. We call these kids “SongFarmer Seedlings.” They are the new growth of our front porch world, and we want to mentor every one of them! WHY START A FACEBOOK PAGE? Although we are not exactly fans of Facebook and recognize its limitations on “promoting” anything, it is in fact an effective network for all the chapters to keep in touch with each other, share idea and pictures, get advice and more. Create your Facebook page, set to PUBLIC GROUP PAGE (not a business, not a musician page but a GROUP Page set to PUBLIC ) so others can find you, and link to the other chapters, especially the SongFarmers Chapters of America page. Post lots of pics and videos! First, become a WFPA member. 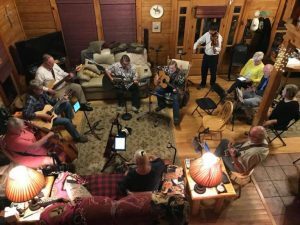 Then, let us know you are starting a chapter (important: email WFPA@WoodSongs.com … we will direct you to a web page with all the artwork, etc you need) Once we have you set up, pick a day and time, and personally invite some musician friends over. After your first one, have your musician friends invite their musician friends to the second one. We call that a “welcome chain.” It works! Keep an email list of everyone who attends. Suggest and provide hospitality IF YOU WANT with simple snacks, everybody brings something. You will be amazed at how willing folks are to jump in and help out when music is involved! Become a SongFarmer and change the way you view your music!